Before World War 2, cars were remarkably different . The "Vintage" cars were nearly all built by hand for the small market of the wealthy. Seldom did these individuals drive their vehicles as it was normal to have a chauffeur to carry out such duty. To compete for a customer the manufacturers had to prove their motorcar was the best money could buy both in quality and reliability. Charles Rolls and Sir Henry Royce achieved this with engineering recognised as "The best car in the world". As testimony, a century later, the brand still resounds this accolade. Post war there was a larger demand and markets saw rise to affordable mass produced vehicles. Price became the competitive issue in the drive to fulfil the masses who wanted to get behind the wheel. This led to more compromised designs and the personal touch was lost in mass production. The founder of our company, Hermon Horsfield, bought our current premises in 1948 and began to buy and sell these production line cars. In process he recognised the comparisons of quality between new cars and the pre-war cars often taken in part exchange. He particularly liked the luxurious old Rolls Royce which occasionally passed through his hands. When his son went to London University in 1956 and needed a car it was decided that the best option was to take a 1930 Rolls Royce that was in stock. His son returned after 3 years with the car giving excellent service and running smoother than ever. Hermon and his son were so impressed they decided to collect other similar vehicles. Little by little public opinion grew to appreciate the quality of workmanship in things of old. 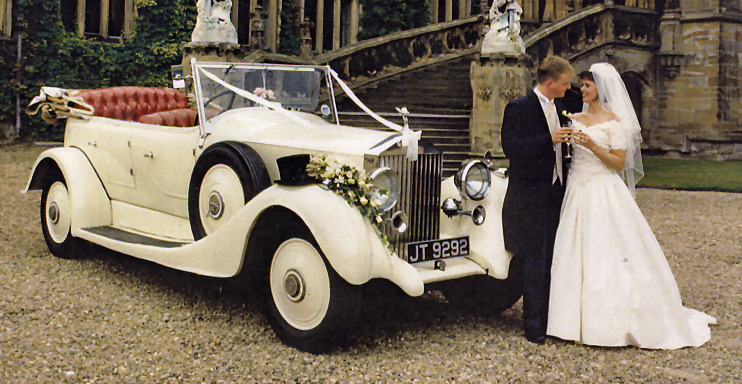 Like the wedding ceremony itself, the modern world is filled with historic traditions and it was noticed how often the company was asked to hire one of the vintage cars for weddings. Hermon's son Derek decided to form a wedding car hire company to formalise these services and called the new company - Horsfields of Halifax. The most requested vehicle was an ivory convertible vintage Rolls Royce so with his experience Derek collected a fleet of similar vehicles. Horsfields of Halifax began offering its services in 1948 and has now carried 1000s of brides to their weddings without one single failure. The success of the company derives from its devotion to the vehicles Rolls Royce produced. Through this and the company's long association with the marque, the knowledge has been gained to maintain and operate the vehicles correctly. We pride ourselves in the presentation of the vehicles and the result of this is shown in many of the kind words our customers have written. The company remains a traditional family business allowing each and every customer a personal tailored service to meet all their requirements. We trust that this background information on Horsfields of Halifax, will enable you to make your wedding transport booking, with the confidence that you have made the right choice.